Eoin Colfer of the highly successful Artemis Fowl series of books is currently Ireland’s Children’s Laureate. 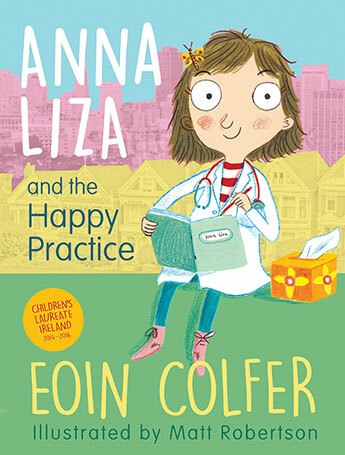 Anna Liza Madigan, his newest character, is a compassionate and adorable child for whom I immediately felt a great affection. Anna Liza’s mum is a psychiatrist. She helps to make unhappy people, happy again. That’s what Anna Liza wants to do too. She has many years of practise ahead of her, so she begins in her mum’s waiting room with the patients’ children. She uses songs, and a list of her favourite knock knock jokes to cheer the children up while their parents are being attended to by mum. When Anna Liza meets Edward, none of her usual approaches work. He is sad because his dad is sad. Anna Liza’s diligent note-taking and an unorthodox solution involving a pair of roller skates, draws Edward and his dad from the darkness. This simple yet meaningful story calls attention to how the sadness/depression that parents experience is frequently absorbed by their children. It sheds light on how children’s misery can become invisible within the shadow cast by the parent’s suffering. Matt Robertson’s stunning illustrations perfectly interpret Colfer’s text. This beautiful book is produced on high quality cream paper. The whole presentation is divine. Its delightful characters and hilarious outcomes create an entertaining read, full of optimism and hope. It will be an invaluable resource to adults who need a starting point for discussion with children about depression, melancholy, or mental illness.